Fast Change Lube & Oil presents thousands to send care packages to deployed soldiers. – Fast Change Lube & Oil, Inc.
Fast Change Lube & Oil presents thousands to send care packages to deployed soldiers. Home/Community/Fast Change Lube & Oil presents thousands to send care packages to deployed soldiers. Fast Change Lube & Oil presents $11,000.00 to Military Missions, raised through its Annual Fast Change Operation Solider Care program, Wednesday, November 1 at Military Missions headquarters in Lexington. 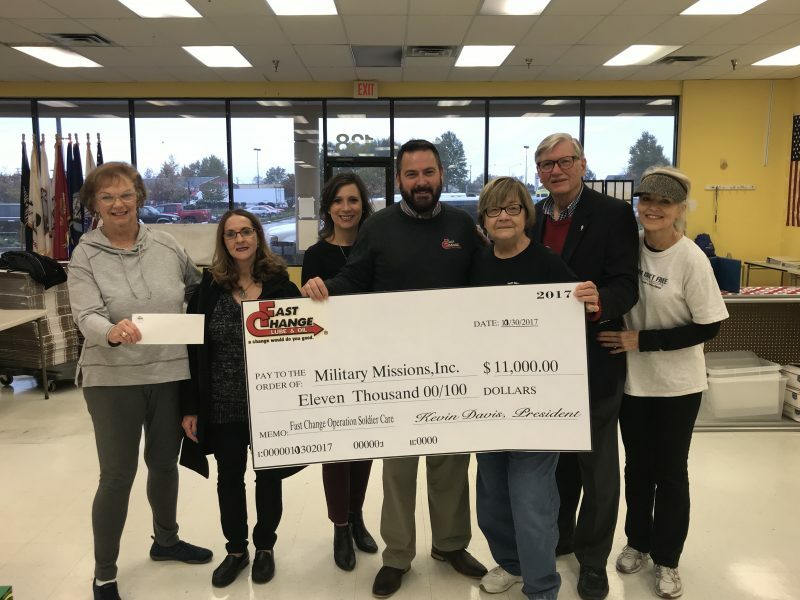 Military Missions, INC. is a non-profit charity organization made up of volunteers who support and honor deployed U.S. military personnel by sending care packages as an expression of appreciation and gratitude to the men and women who are providing safety for all of us. All 20 Fast Change locations participated in “Fast Change Operation Solider Care”. WEMM Radio in Huntington, WV. and Fast Change Lube and Oil teamed up in the effort to support our troops. Fast Change customers donated care items and gave monetary donations. With the help of the Fast Change team and loyal customers, Fast Change doubled last year’s donation of $5,000.00. 100% of the funds to Military Missions will go to sending care packages to deployed soldiers. Fast Change Lube & Oil President, Kevin Davis, said “It is a great honor and blessing for us to sponsor the Fast Change Operation Soldier Care to provide care packages through Military Missions to the Great Men and Women Serving Our Country! I appreciate all that helped to make this such a successful event. It was through the efforts of our Fast Change Team, our Customers and WEMM Radio that we were able to make this presentation to Military Missions”. U.S. Veteran and longtime volunteer, Fred Doster says Military Missions, INC. sent over 7,000 care packages to active duty military members last year and he expects that number to rise this year. Doster recalls being deployed overseas and not receiving anything quite like what Military Missions send its troops. Fast Change Lube & Oil proudly support our troops. Show your military I.D. at your next Fast Change visit and receive a discounted price on our many services. For more information on Military Missions please visit http://military-missions.org.